Abrasion Index Indicates the abrasiveness of coal by monitoring the loss in weight of four metal blades which mechanically stir a sample of sized coal. The index is the number of milligrams of metal abraded from the metal blades per kg of coal used. Based on a test known as the Yancey, Geer and Price test. Now an ISO standard. AIR- DRIED Equivalent to as analysed basis when the analyses have been performed on an air-dried sample. For calculation to different bases. AIR-DRIED MOISTURE The moisture in the coal sample after achieving equilibrium with the laboratory atmosphere by exposure to it. Sometimes called residual moisture. No equivalent term in ASTM, although air-dried moisture can refer to a sample dried in an oven with warm air. As analysed basis Analytical data expressed as the moisture content at which the sample was analysed. For calculation to different bases. As received basis Analytical data calculated to the as received moisture content. For calculation to different bases. Ash The inorganic residue after the incineration of coal to constant weight under standard conditions. It is less than the mineral matter because of the chemical changes occurring during incineration, with the most important differences being loss of water of hydration, loss of carbon dioxide, and loss of sulphurous gases form sulphides. 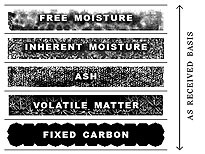 Ash fusion properties The fusion properties of laboratory prepared coal ash which are demonstrated by the heating of the ash in a mildly reducing or oxidizing atmosphere. The temperature range generally used is 900oC up to 1600oC, and the temperatures which can be recorded are initial deformation temperature, softening temperature, hemisphere temperature and fluid (flow) temperature. Almost invariably, temperatures recorded under reducing atmosphere are lower or equal to those recorded under oxidizing atmosphere. Of the characteristic temperatures, the initial deformation and flow are generally the most difficult to reproduce. Ash viscosity Ash viscosity is a very difficult and expensive measurement to make. Generally, consideration of it takes the form of estimation of the temperature at which the ash viscosity is 250 poise, i.e. T250P, which can be obtained by calculation from the ash analysis. A viscosity of 250 poise is approximately the maximum acceptable value for tapping slag from cyclone furnaces. Audibert-Arnu dilatometer A caking test most commonly used in Europe which measures the expanding and contracting characteristics of coal. Finely crushed coal is compressed into a pencil, which is heated slowly and as the coal passes through its plastic range, initially gets shorter (contracts) and then gets longer (expands). Measurement taken are the maximum contraction and maximum dilatation (expansion) both expressed as a percentage of the initial pencil length, such that the maximum contraction is always positive, and the maximum dilatation is positive when the pencil increases in length from its initial length, and negative when the pencil decreases in length. Temperatures of initial softening (first indication of the pencil contraction), maximum contraction and maximum dilatation are also recorded. Results from this test are very sensitive to oxidation of the coal being tested. The Ruhr dilatometer is similar to the Audibert-Arnu dilatometer, the major difference being in the compaction of the coal pencil. Ruhr dilatometers show less contraction and more dilatation than Audibert-Arnu dilatometers. Washability The relationship between coal ash and relative density of a coal fraction, determined using laboratory float and sink techniques.